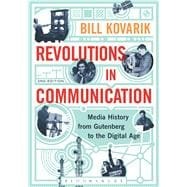 Bill Kovarik is a Professor of Communication at Radford University, USA. He first learned to set "hot" type on a Linotype machine in 1970 and has observed major changes in the mass media while working with the Associated Press, Charleston Post, Baltimore Sun and other publications in the USA. He is the author of five other books about environment and mass media, including Mass Media and Environmental Conflict.